Before the construction of the Bills current home, New Era Field (formerly known as Ralph Wilson Stadium), the team played at War Memorial Stadium, a classic old stadium located along Dodge Street, Best Street and Jefferson Avenue. Construction of a stadium in the Buffalo area began in 1935 as part of President Franklin Roosevelt’s WPA programs. A single tier grandstand stadium that enclosed the field was constructed and opened in 1938. Upon its opening it was known Roesch Stadium, Grover Cleveland Stadium and Civic Stadium before finally being named War Memorial Stadium in 1960. It originally had a seating capacity of 35,000. Before the Bills arrival, the stadium hosted several early NFL games, numerous track and racing events and baseball games. In 1947, the All American Football Conference awarded Buffalo a franchise that became the Bills. The team became a member of the AFL and played its first home game as a member of the league on September 18, 1960. The Buffalo Bills played at War Memorial Stadium for thirteen years until they moved into Ralph Wilson Stadium. The Bills played their last game at the stadium on December 10, 1972 against the Detroit Lions. In the 1960s the stadium saw one major addition, an upper deck on the north side that gave the stadium a hodge podge look. This gave the stadium a seating capacity of 46,201. 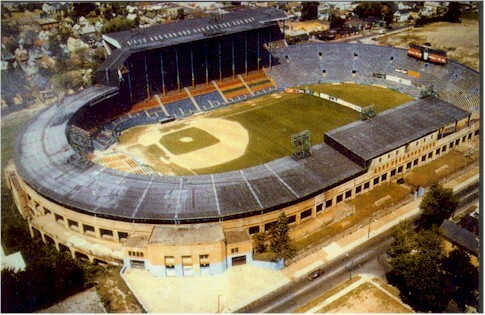 War Memorial Stadium sat basically empty after the Bills moved out until 1979 when the Triple AAA Buffalo Bisons baseball team moved back to War Memorial Stadium. The baseball team had played at War Memorial Stadium at various times since 1961. Over the years, people in Buffalo gave War Memorial Stadium the nickname, the Rockpile. Over its half of a century of existence, the stadium saw many great players play on its playing field. By the mid 1980s the stadium was showing its age and it was demolished in 1988. Today it is the site of an athletic facility.